How to put up an Organization? *To sign up for an event, click Here . A lot of students have been requesting for vending machines to be placed within the campus. If we were to have vending machines to service the students and employees all day, what would you prefer? Ms. Divina Amor C. Salcedo-Barcelona at the Student Services Office. You can vote only once! • Wash Day is a day when all students are allowed to attend their classes on campus wearing smart casual wear. Of course there will be guidelines as to what “smart casual wear” is all about—yes to full length tapered jeans but BOO to torn and baggy jeans. YES to closed shoes, and NO to any kind of flip-flops. You get the idea. And full details will be made available for your information and compliance. • If the YESes win, Wash Day will be every Saturday. Much as we would like to have this on weekdays, please note that we often welcome friends from the hospitality and corporate industry who expect us to be properly dressed in our uniforms. We know you understand. Pls. check all your enrolled subjects in pinnacle before going to class. Any changes or revisions without Registrar approval is not considered official and may result to a failing grade. 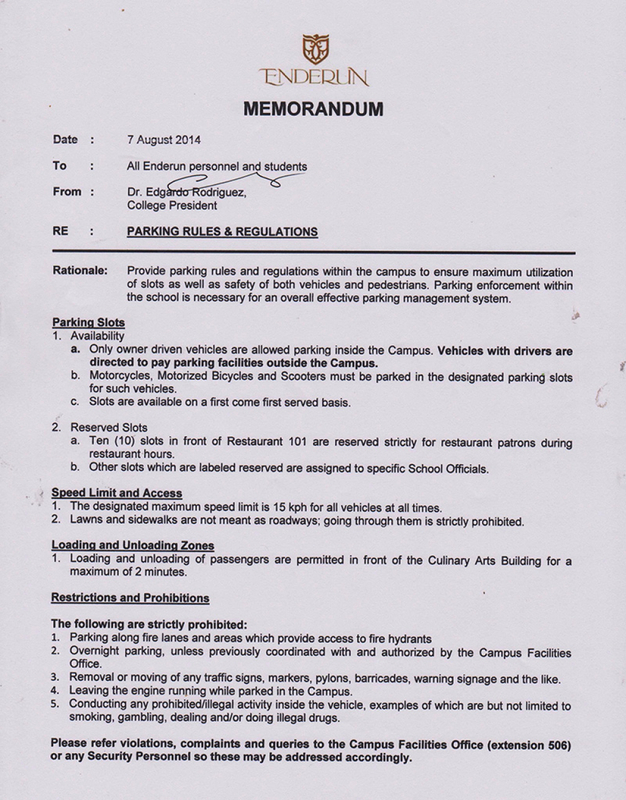 Please be guided accordingly . ALL STUDENTS: Please confirm your classes for Summer in BA 204. Slots are reserved on a first come first serve basis. Thank you. •	Submit accomplished Registration Clearance Forms together with issued service number to the Registrar Officer before doing load revision. ** NOTE: ALL students need to be in complete uniform at all times! 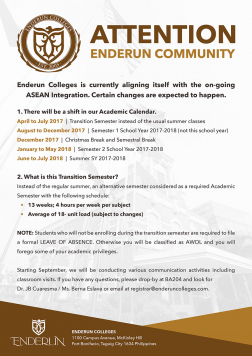 1) Changes in class schedule may occur after enrollment. After payment of tuition fees, consistently view your pinnacle account for your OFFICIAL CLASS SCHEDULE. 2) Revision of Loads should be done through the Registrar's Office only!! 3) Arrangement with faculty without Registrar approval is NOT considered official. a. Meal Cost – PhP 100.00. Please note that requesting for half portions of 2 viands will no longer be allowed. If you want a second viand this can be purchased at PhP 50.00.
a. Other options – see Station Cycle below for details. ( Items subject to change without prior notice). *** Breakfast is served at the Bar area. 1 meal includes Soup or Salad, 1 Viand, Vegetable, Garnish, Rice and Dessert or Fruit. ** Menu is subject to change without prior notice. Note: All these items may be claimed by the owners who must produce some proof of ownership, even if it is only the ability to describe the item. Non claimed items will then be disposed of. Brown Shoulder bag with diary, comb, perfume & etc. 1. Bring your own padlock. 2. Choose any locker within the campus and use that throughout the day. 3. At the end of your class retrieve all your things and your padlock from the locker. 4. Next day repeat the process. 2. Lockers are to be used only once a day. 3. All lockers are available for use by all students. 4. No one is allowed to leave their belongings in the locker overnight. 5. At 10:30pm, security will roam the campus and check for lockers with items still inside them. 6. If a locker is padlocked after 10:30pm, security will destroy the lock and the items inside retrieved and stored in the lost and found area. 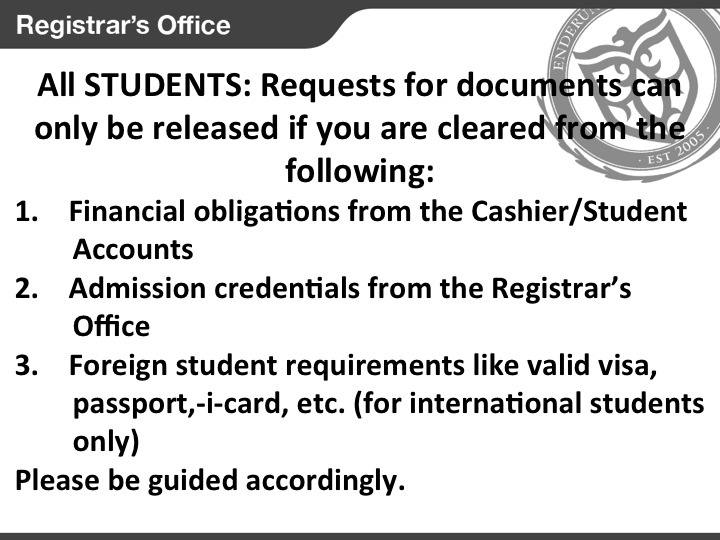 Proceed to the Office of Student Life for further information and/or inquiries. 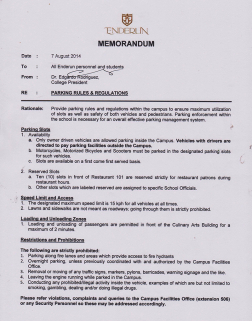 For everyone's information and strict compliance. Upon submission of the hard copy, you must sign-up for your schedule to present to your Internship Advisor and submit to him/ her another hard copy of your report. Presentations must be completed by December 15, 2012 if you wish to be issued your internship grade within the semester. All those who do not submit and present their requirements within this period will receive a FAILING grade for internship. ATTENTION ALL STUDENTS WITH LOCKERS: Please ensure that you already have vacated the lockers you used during the 1st semester of this school year. Those who have not cleared out their lockers by Friday, November 9, 2012, we will forcefully break the locks and place all your things in the lost and found items. Instead of signing up for reservation, a new locker system for 2nd semester will be announced within the week. Thank you! Attention CA and HA students: You may start ordering your tailor-fit Kitchen Uniforms starting today until October 29 ONLY. Please note that tailor fit uniforms take 2weeks to be made. Ordering after the 29th will not ensure timely delivery of orders. 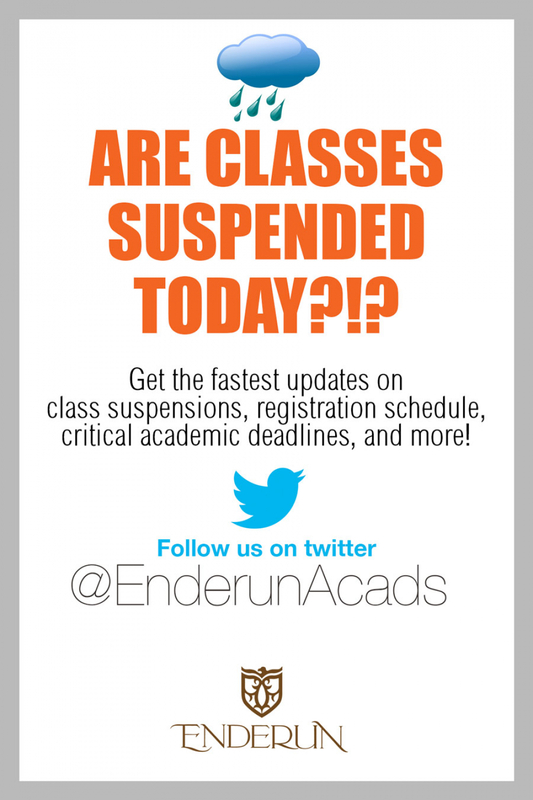 Please be informed that classes for today (July 21, 2012) are suspended due to inclement weather and heavy rains. Stay safe and alert. REACH in partnership with Culinaire brings you AWARENESS WEEK! "The Trash to Cash Program". Watch out for more games, prizes, contests and much more! Taste the yummy goodness of Culinaire's rice toppings! It will be held at the Atrium from July 30-31 and August 2-3, 2012. See You There! Midterm exam will be held on Wednesday, August 15, 2012 during regular class time. Coverage will be until the last topic discussed. We will have our QUIZ 2 on Wednesday, August 15, 2012 from 4pm-7pm. 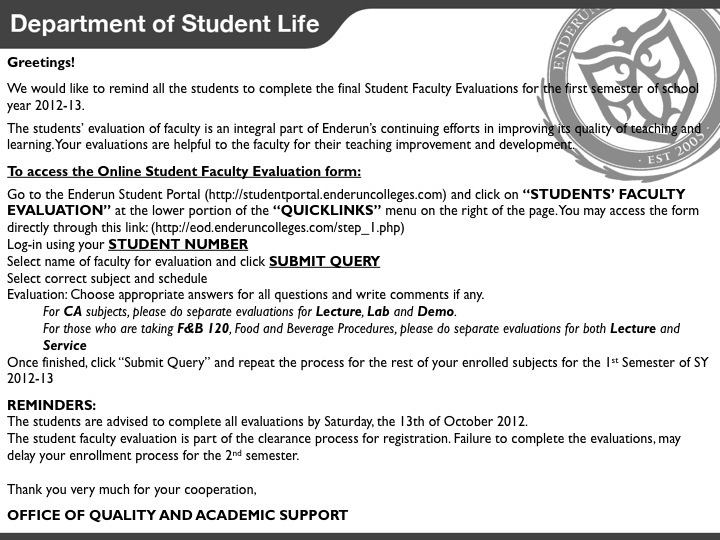 Please check email for midterm guidelines. Class will resume on Monday, 18 July 2016. Requirements: Must be a college grad. better if they have experience with marketing positions. Those. with Photoshop and/ or photography skills are encouraged. If you are interested, please send your resumes to tiffany.santos@enderuncolleges.com with the subject heading "Digital Marketing Manager"
The Four Seasons Hotel, Bahrain Bay is the latest addition to the global network of hotels which are at the forefront of the hospitality industry. In each hotel, dedicated staff make every stay a luxurious pleasure for business and leisure travellers alike. The four Seasons highly personalized 24-hour service, combined with authentic, elegant surroundings of the highest quality, embodies a home away from home for those who know and appreciate the best. At Bahrain Bay, the hotel will occupy the central island where guests will have stunning 360 degree views of the community and the Manama skyline. The striking design will make it an iconic landmark for the Kingdom - as well as setting new standards in comfort, luxury and style. There will be an on-site recruitment for CA graduates at Enderun Colleges on SEPTEMBER 3, 2014 (WEDNESDAY), 9AM. They are looking for qualified culinary staff to be part of their pre-opening team. Interested applicants must send their CVs to pauline.dedel@enderuncolleges.com. 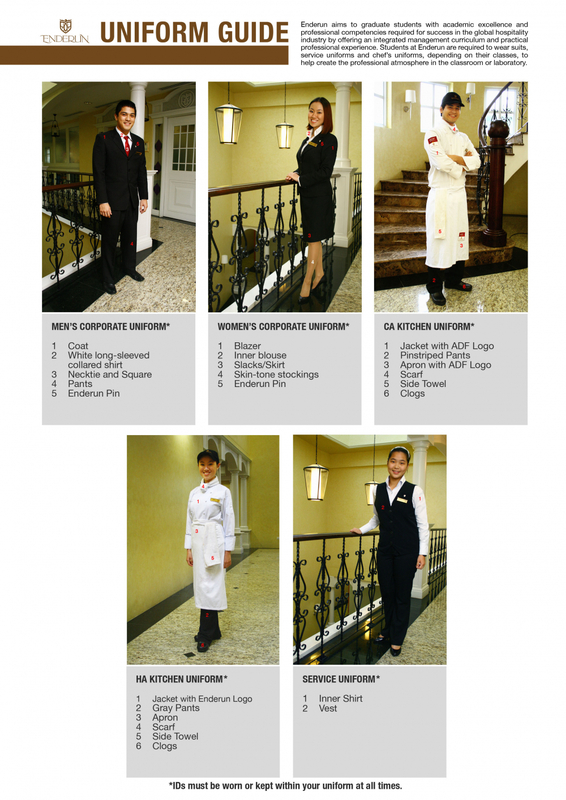 In general, students can choose to wear either the full corporate uniform or wash day attire. Appropriate pants / jeans. Note that jeggings, shorts and skirts are NOT permitted. Any "closed" top shoe, including sneakers. Note that sandals, slippers or open-toe footwear are NOT permitted. 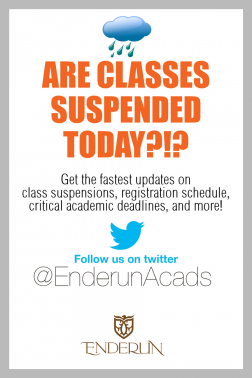 The Enderun ID must be worn at all times when in campus. Students with improper and/or incomplete uniform will receive a violation slip and will incur the corresponding demerit. The Career Services Office is now accepting internship applications for Chatham Bars Inn, MA and Hyatt Regency Chesapeake Bay. For more information on these opportunities, please visit the Career Services FB page. ATTENTION: IHM AND CERT STUDENTS FOR NOVEMBER INTERNSHIPS. We have a new internship opening for THE RITZ-CARLTON HONG KONG.Department: Kitchen, Food and Beverage, and Guest Recognition.Program Duration: November 2013 – March 2014. Package offered: Training Allowance (HKD 2,340/mo), Duty Meals and Uniform. They are NOT offering accommodation. 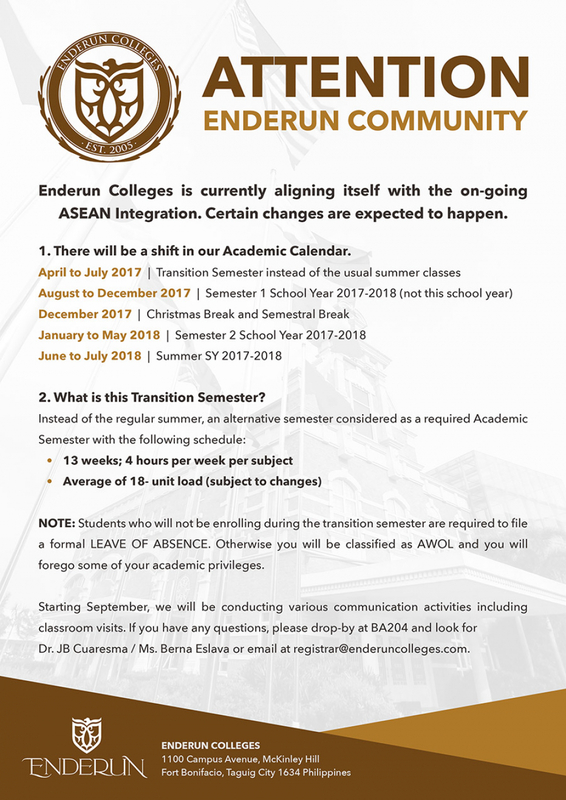 Please send applications to international.internships@enderuncolleges.com. Deadline is on September 2, Mon, at 12 noon. For full details, please visit the Facebook page of the Career Services. Thank you. Traders Hotel is looking for students to join their internship program this coming June 2013. Details are posted on the FB account of career services. Message is subject to approval.